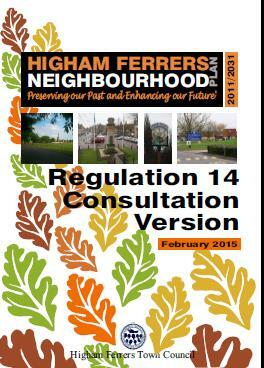 The Higham Ferrers Neighbourhood Plan Steering Group has now completed the draft Neighbourhood Plan and we want to get your views to ensure we are on the right track and that you agree with the strategy we have developed on your behalf. The Plan can be downloaded by clicking on the links below. A hard copy can be viewed at the library or the Town Hall. If you would like a hard copy of the plan please contact us on 01933 312075. This is your draft Neighbourhood Plan! It has been drawn up using the views you have given us during all the consultations which have been held during 2012, 2013 and 2014. We now need your comments before it goes on its next round of consultation, which will be conducted by East Northamptonshire District Council. It’s very important that you take the time to read the draft Plan and give us your views, as these will add strength to the proposals. If you disagree with anything, we need to know so that we can take this into account and make amendments where appropriate. YOUR opinions are valuable – It’s YOUR community and town, please let us know what you think.